There's been a lot of hub-bub online regarding the new Disney Villain Limited Edition Dolls that have been released this Autumn. I did not end up getting any of them as I couldn't completely justify spending the money on any particular set that I didn't totally LOVE. I'm a huge Disney fan and really love all of the characters, but I didn't want to get one "just to get one". Normally I don't collect the limited edition dolls as they are a bit out of my budget and they always get released in clusters. There is usually a scramble to get them and then they are always so much more expensive on the secondary market if you miss out. The only Disney Limited Edition dolls I currently own are the Anna and Kristoff Frozen Fever dolls as well as my favorite Disney Fairy, Fawn. I have yet to do reviews on them, but they are on the list! Anyway, as I was browsing the Disney store website, a little bummed that I didn't end up getting the Ariel and Ursula LE dolls, I happened to notice two new Deluxe dolls that I hadn't heard about and was amazed to see Rapunzel and Ariel! I was especially impressed by Rapunzel as I think her promo photos looked absolutely stunning. I ended purchasing her and here is my quick mini-review in case you were interested in purchasing her for yourself! My first impression as I took her out of the package, was amazement at the size of her. I knew she was going to be 16 inches tall, but I guess I didn't really expect how big that would actually look. Her packaging was much nicer than I expected. This Deluxe Feature doll retails at $49.99 and can be found here at the Disney Store website as well as in-store, I'm guessing. This version of Rapunzel is from the village scene where she is able to dance and interact with people for the first time. Some of the little village girls transform her long locks into an elaborate braid and decorate it with lots of flowers. Although she is not advertized as a "singing doll" she has an interactive feature where she sings the "Healing Song" from the movie and her hair and lantern subsequently light up. Here are the back and sides of the box. The box is really nice for collectors that want to keep their dolls safe inside. The colors are really pleasing and she is posed very nicely. Here she is next to my Limited Edition Anna doll, just to give you an idea of how big she is. On the outside of the box is a button you could press to test out her singing and light feature. 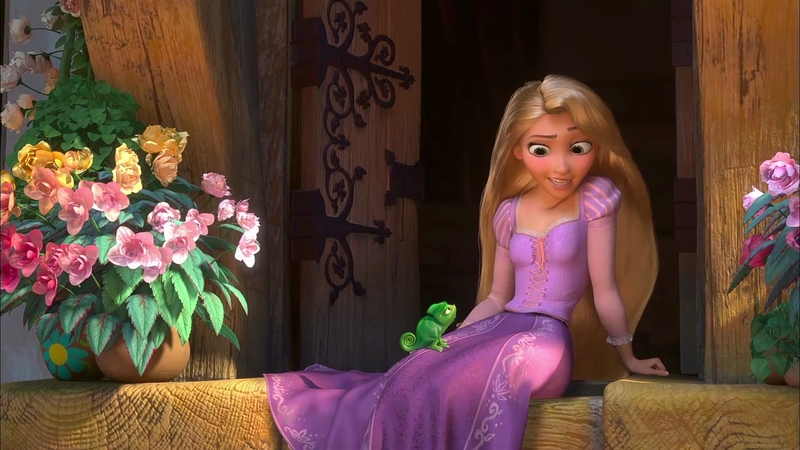 Rapunzel sings a line from her "healing" song and it is the original voice of Mandy Moore who did Rapunzel's voice from the movie Tangled. My lantern didn't appear to light up, but I'm not really sure I have figured it out yet. I have only been using the tester button so far! UPDATE: It does light up as long as the lantern is positioned over the bulb in the palm of her hand. She also sang the whole song! 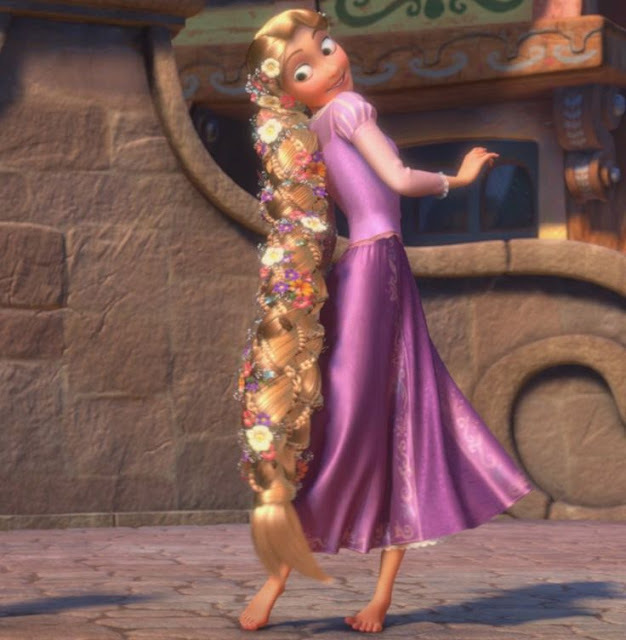 Rapunzel's hair was definitely the biggest feature about this doll that drew me in. It's rooted hair and a gorgeous golden color, very nicely styled with strands of gold tinsel to give it the appearance of extra shine. It's arranged in one long braid with two smaller braids woven into the hairstyle. She has a cluster of plastic colorful flowers intertwined with larger red flowers which are the actual light bulbs that light up when activated. Her dress is extremely detailed and well made in my opinion. It's close to the movie version, but much fancier. Tonner Nu Mood Jess modeling another version of the dress. The inside of the box shows an image of Rapunzel's tower. Here she is out of the box. That long cord to the left is the button you press to make her sing and light up. It was attached to the front of the box as a "tester" button. I haven't had time yet to figure out the exact mechanism of how it all works, although I would assume it has to do with the little button on her hand. One thing I wanted to point out is that she has less articulation than I expected. She can only move her head from side to side, and has movement in her hips and knees (hinged). She can not twist at the waist. She can move at the shoulders, elbows and wrist of one hand. She has no articulation in her ankles or the wrist of her "singing" hand. When you put Rapunzel's braid to the back of her, you can see the braid in more detail. There are only flowers on the front of the braid, unfortunately. 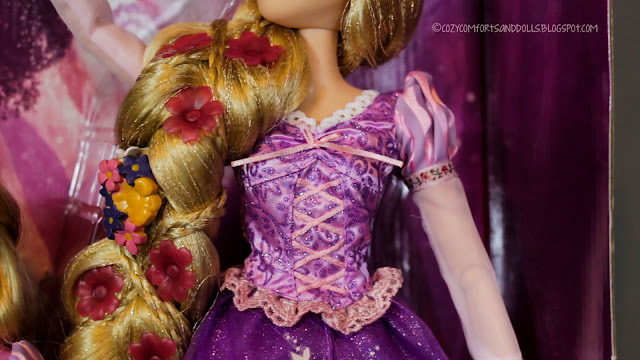 Rapunzel shares a similar face mold as the 2015 Classic Rapunzel. Hannah did a great review of her here on her blog Never Grow Up. She has big two-toned green eyes with brown highlights. Her eyes are forward facing and she has more eyelashes then previous versions. Her eyebrows are thinner and darker and her freckles appear softer and more realistic to the animated version. She has a touch of pink eye shadow and nicely done pink lips. Although her make up is heavier than her animated character, it is still nicely done and I prefer this natural look over her overly done Limited Edition versions. The previous Rapunzel face ups. Here's the 12 inch 2014 Classic and Palace Pets Rapunzel. Here's a look at her from a few different angles. I'm not quite sure I like the forward facing eyes as much as the side glancing ones. Be careful when you cut the plastic ties out of her head...as you can see I snipped a few hairs! I will have to figure out how to smooth them back into place- gel or hairspray? And here's a few more details. 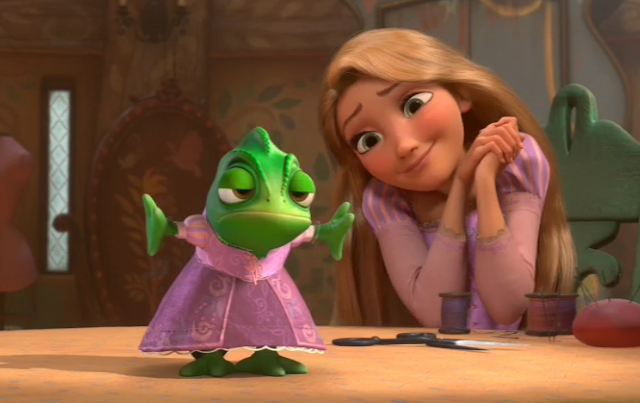 Well, I hope you guys enjoyed my mini-review of the newest Rapunzel! Sorry, it's not as thorough...I feel a bit rushed as hubby and I are leaving this morning for a 2 night stay in Mystic Connecticut. I'm sure someone else will do a much more detailed review in the days to come! I'll see you all soon and hope everyone has a Happy Halloween! 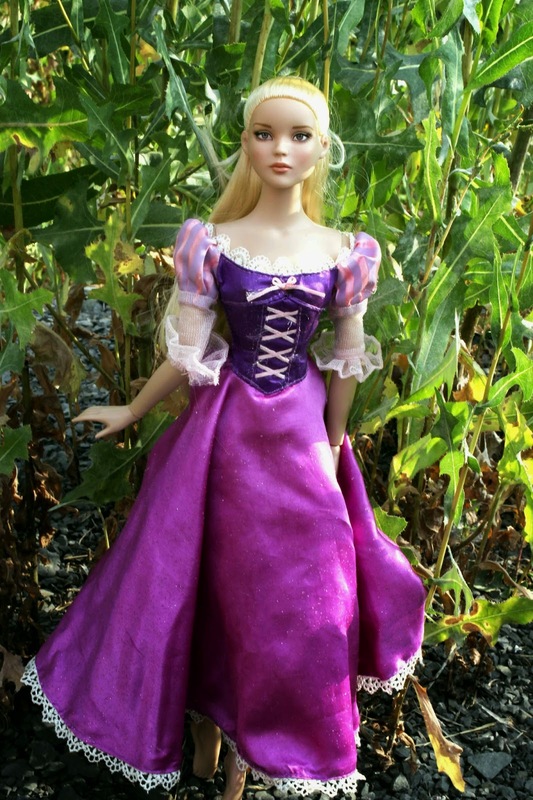 Fantastic review of your new Rapunzel doll! I really enjoyed it. This doll is so beautiful.I really like her but I won't get her because I only collect 12" dolls and little kids and babies for them.Congrats on getting her. Wow Farrah, she is a big girl indeed! I like her hair so much, I can understand why you couldn't resist her! I do like Disney products but don't have any girls in this size. However, I now am the very pleased owner of two of the Disney Animator dolls, which I got for half price in the Disney shop when I was in the UK, so watch out for those on my blog! A nice review of this girl, her hair is very pretty. I think I'm with you on the side glancing eyes though, I always like those on my dolls. Have a great time in Mystic Connecticut! I love her cute freckles. She's pretty. Hi! Can you recommend a doll stand for this doll? Thank you.